Troubling on so many levels. The stories of the women in prison are memorable. How can something like this happen? The phrase, "Justice is blind," can be viewed in a negative way as she shows. Awesome book about her story with the government and treatment in jail. An eye opener for sure and very scary. Must read. I have even more admiration for Susan than I already did after reading this book. What was done to her by the OIC was unconscionable, but her strength of character and her ability to make the best of even the worst circumstances is admirable. She was a young, naive girl whose only real "crime" was trusting too much. She is now a wizened woman who gained tremendous insight into the plight of many women in prison and has turned what she learned into a campaign to help those women. This book wasn't just her story, she also shared the stories of many of these women who she met and who deserve to have their stories told as well. I highly recommend this book. This book really opened my eyes to the dishonesty in our American Government; what it's really like behind closed doors and how we are not as free as we think we are. I commend Susan McDougal for her honesty, even if telling the truth landed her in prison for 18 months. The book was a surprise! 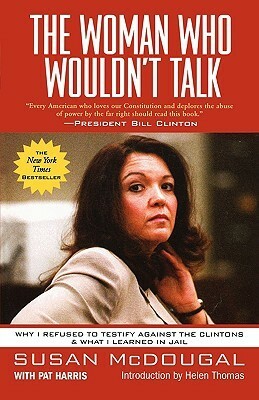 Expecting to find trash on Bill and Hillary Clinton, McDougal took another approach and enlightened the reader about her life and jail experiences and what she learned about human nature. Mostly a good read. Even now it's hard to believe it actually happened. I found this book to be fascinating, while finding new respect and awe for Susan McDougal. What the right-wing did to her, an innocent person, is hideous - but, not at all surprising. Susan McDougal talks about her life, the Clintons, and being the focus of Ken Starr's Whitewater crusade. Susan McDougal Helen Thomas PatHarris - One of the few people who served prison time as a result of the Whitewater controversy in the United States, though fifteen individuals were convicted of federal charges. She is most notorious for refusing to answer "three questions" for a grand jury about whether President Bill Clinton lied in his testimony during her Whitewater trial. Her refusal led to 18 months jail time for contempt of court, which was most of her total 22 months of incarceration. McDougal received a full Presidential pardon from outgoing President Clinton in the final hours of his presidency in 2001.